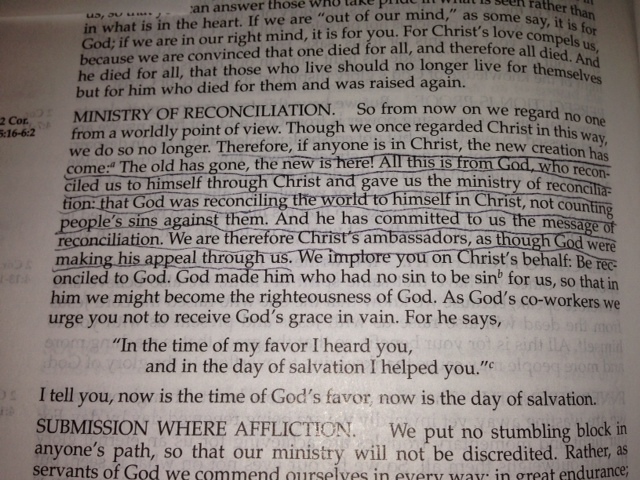 When we put our faith in Christ, we are transformed into new people. And the message God entrusts with us to pass on to others is that everyone needs to be reconciled to God. God has already reconciled us to himself by Christ’s sacrifice on the cross. Now all we have to do is accept God’s gift of grace to complete the process. We don’t have to ‘do good things’. We don’t have to give up all of the fun things in our lives. We don’t have to try to be ‘good enough’. After we accept God’s grace and are restored into a relationship with him, we become his ambassadors. God makes his appeal to the world through us as we grow in our relationship with him. The old is gone! The new is here!